Brand loyalty is hard to maintain in the UK at the best of times, especially in the beauty industry, even when there is a gift with purchase as savvy shoppers will go to the counter with the best gifts. I remember in my days behind the beauty counter, my regular customers would apologize for going elsewhere when there was a good GWP, but my company did have a loyalty card system and when a certain amount of points was reached they would get a free product. I was lucky that I was able to give out bonus point stickers, and it did help my account, but these days the stakes are much higher. Many stores now offer loyalty cards across all brands, to keep the customer in the store, as fewer people are 100% brand loyal. Here are some of the best ones that have less small print, and that offer bonus points and offers throughout the year. These promotions are important, because there is nothing worse than a loyalty card racking up points to unachievable rewards. Boots Pharmacy: The Boots Advantage Card has been a popular loyalty card in the UK where you get 4 points for each £1 spent. In addition you get a free copy of the Health and Beauty magazine, as well as invites to store events. The store often promotes it’s own brands (No.7 and their own skincare ranges) and offers bonus points when these are purchased. There are always 3 for 2 offers, or buy one, and get one half price, and less frequently these days are the BOGOFs. The most convenient thing is points can be redeemed whenever you want (simply to pay for a sandwich), or save the points for a treat. Boots stocks major self-selection beauty products, their own ranges, and premium brands including Chanel. 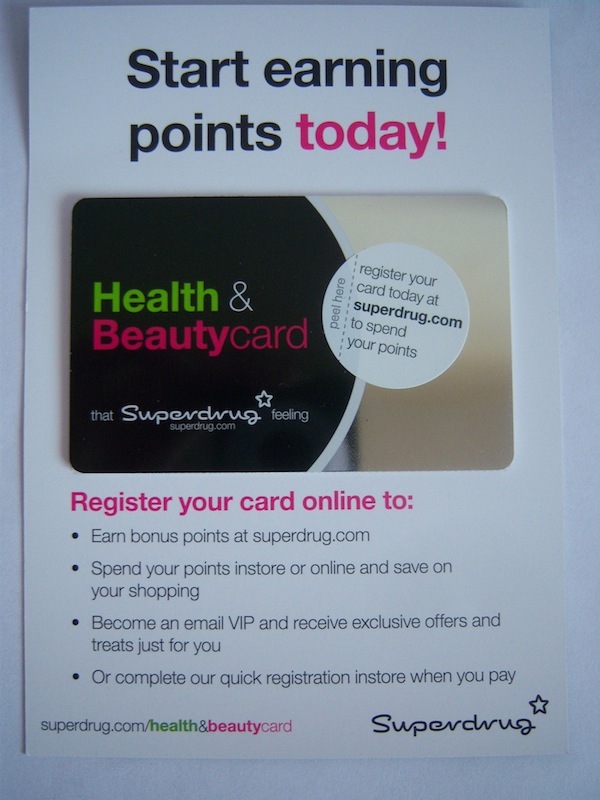 Superdrug Pharmacy: The Heath & Beauty Card has lots of additional features. It’s free to sign up, and all card members get free standard delivery on orders. Each Thursday there is an email with an offer, valid just for that day which can be triple points on a brand, or 10% off all fragrances. There are an abundance of offers online and in store, and you get a point for each £1 spent. Redemption is available in multiples of 100 points at a time (100 points = £1, 200 = £2), and you can sign up online or pick up a card in store, but you must register it online. Superdrug also has several exclusive ranges such as MUA and GOSH cosmetics, which are two of my favorite self-selection brands. The Body Shop: The Love Your Body Card isn’t free to join, and costs £5 per year, but can be worth it if you do buy there regularly. Sometimes there is a free gift when you sign up (currently a free 100 ml Peppermint foot scrub), but you get 10 points for each £1 spent, and get a £5 voucher when you reach 500 points. You also get a £5 birthday voucher, so that does pay for the membership theoretically. All cardholders get 10% off all year off purchases in store and online, but there are often exclusions, so you need to check first. Debenhams: This store has it’s own Beauty Club Card where you can earn 3 points for every £1 spent. For every 500 points you get a £5 reward voucher. The benefits of being a member include; free delivery with online orders, a free brow wax during your birthday month in store from Benefit, and bonus points offers. You do need a valid email address to register your card, and you can only get a card from in store (which is free), but you can’t register online and be sent a card. House of Fraser: The Recognition Reward Card allows you to collect a point per £1 spent, with bonus points on your birthday. There are the usual exclusive discounts, and cardholder events available both online and in store. Once you accumulate 500 points you get a £5 reward, which is loaded onto your card automatically. You have three months to spend the rewards once you claim have claimed them. With the exception of The Body Shop (which I included as the membership fee is paid for by way of a birthday voucher) the cards are free. Encouraging customers to be store loyal means that people can buy several brands, and it incentivizes companies to hold cardholder events to promote new products, or services. Some will charge a ticket fee, redeemable against a purchase on the day, and these are worth it if you are looking to buy something, as the goody bags on offer are usually generously curated. Having a member list allows stores to target their marketing, but also you as the customer benefit with discounts and free gifts. Nearly all will offer a birthday treat, whether it’s a free gift when you come into store or a generous discount to be used during the month, so it’s worth signing up for the cards as the schemes are getting more competitive and generous with their offers. Over the years loyalty clubs change their rules, perks, and terms and conditions and those with restrictions often mean people won’t sign up. In the case of Debenhams, your account is closed if you don’t use the card at least every 24 months, and if you don’t use your rewards within 6 months you forfeit them. All these schemes can change their rules without any notice, so I recommend using up points or rewards as soon as you can. The important thing is to still shop around for the best price, deals, and the ease of use of the points on offer.